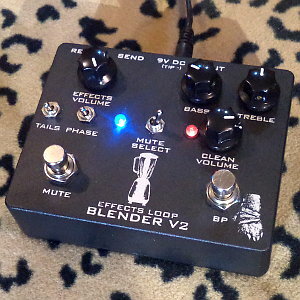 The Blender V2 is an effects loop blender with a fully buffered effects loop. The instrument signal is split into 2 channels, sent to the effects channel and the clean channel with it's tone controls, and then mixed back together via separate volume controls for each channel. The clean channel or the effects channel may be switched on or off apart from the main bypass via the second stomp switch. The clean channel has a Baxandall type tone section offering cut and boost to bass and treble. With controls at noon the tone response is completely flat. The Phase switch on the effects loop to handles effects pedals that return a signal out of phase with the send. The Tails toggle switch allows the return of the effects loop to stay on after the effects loop send has been switched off to allow delay trails to continue.